You made a smart choice in choosing an iPod. 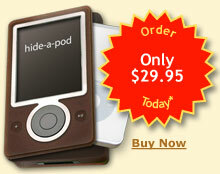 And now you can protect it from theft and still enjoy using it in public with the new Hide-a-Pod anti-theft case. It’s really very simple. Just tell us what iPod model you want to protect and we provide a gutted and hinged Zune with our custom molded iPod casing adapter. We also include a custom cable from the Zune’s controls (see FAQ) and audio output jack that you simply plug into your iPod. No iPod modifications are necessary. So you have a shiny new iPhone? It needs protection too. After all, you stood in line for days to get your iPhone. It would be a tragedy to lose your precious device in only a few seconds. But there’s no need to be concerned, because Hide-a-Pod is ready to serve. Just pop your iPhone inside for instant protection. Just like the iPod version, you connect one simple cable and you’ll still have access to all the great features of your device. And just think, for the first time the Zune will have Wifi that is actually useful. So the Zune can wirelessly “squirt” tunes to other Zunes. It’s not like there are any other Zune users to share songs with anyway. But we still don’t want iPod owners to be left out or intimidated. That’s why we developed the optional squirt feature. Simply slide the squirt module into your Hide-a-pod then fill the small tank with liquid. Now you’re ready for hours of wireless fun. Press and hold the Zune’s play button and squirt away. Take that you iPod haters! Be sure to check out our frequently asked questions page. You’ll also want to stop by our testimonials page to see what our satisfied customers have to say and share your own stories.